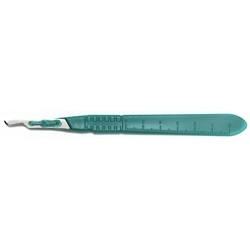 Size 15 sterile scalpels that incorporate superior stainless steel blades on uniquely designed handles. Sterile. Sold 10 per box. Size 15 scalpel. Superior stainless steel blade on a uniquely designed handle. Each scalpel is supplied with a flexible blade cover for complete user protection. Manufactured by Cincinati Surgical. Size 15 scalpel. Manufactured by Miltex. Size 15 scalpel. Manufactured by Aspen Surgical Products.